So it’s Shrove Tuesday, which here in the UK is celebrated with pancakes, generally something which I have absolutely no objection to whatsoever. It was pancake day on one of our first dates, so my husband and I always mark it- usually with some crepes stuffed with spinach, ham and cheese, slathered with more cheese before baking. Sweet ones to follow, of course. 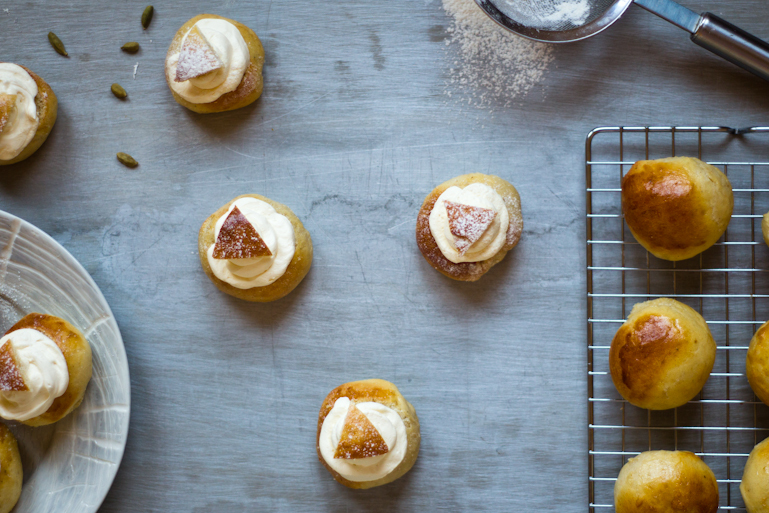 ‘At some point Swedes grew tired of the strict observance of Lent, added cream and almond paste to the mix and started eating semla every Tuesday between Shrove Tuesday and Easter. I know that my last post exalted the virtues of restraint and substitution in order to make a sweet treat a bit healthier. This post, by contrast, is really all about excess, which is as it should be on the last day before Lent. 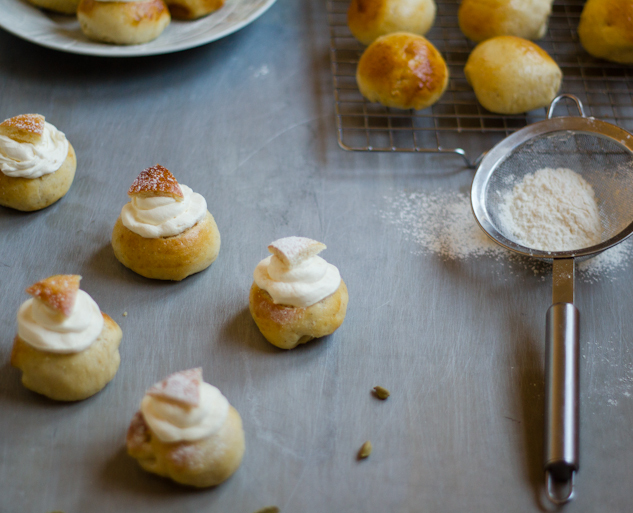 My take on the semla uses plain flour, which gives them a cakier texture and just a dash of cardamom- it’s more for the scent than anything else. Unfilled they freeze really well, so you can make them in advance and have a stash to hand. 1. Melt the butter in a small pan over a low heat. Add the milk and bring to blood temperature. Crumble the yeast into a large bowl with the sugar. Pour over a little of the milk mixture and stir until the yeast and sugar has dissolved. Add the remaining liquid, 1 beaten egg, salt and cardamom. 2. Gradually add the flour, stirring until the dough comes away from the sides of the bowl. Tip onto a lightly floured work surface and knead briefly, until it comes together to form an elastic dough. Return to the bowl, cover with a tea towel and leave to rise for 1 hour. 3. 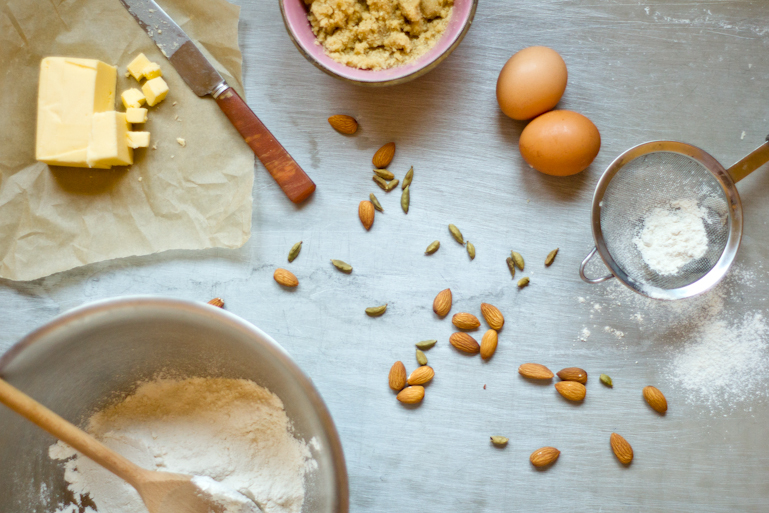 Meanwhile, make the almond paste by blitzing the blanched almonds to a fine powder. Add the sugar and continue blitzing to a smooth paste- it may take a little while for the oils in the nuts to release, be patient. Cover and pop in the fridge until needed. 4. Tip the dough out of the bowl and onto your work surface. Knock back a little before dividing and rolling into buns. Place on a lightly oiled baking sheet, about 2 cm apart. Again, cover with the tea towel and leave for about 45 minutes, until almost doubled in size. Preheat the oven to 200C/400F/gas mark 6. 5. Beat the remaining egg and use to lightly glaze the buns. Bake for 7-8 minutes for small buns and up to 10 for larger, until golden. Cool on a wire rack completely. 6. To serve, cut off the tops of the buns and scoop out a little of the bread-y middles. Fill with a spoonful of almond paste and spritz or spoon in the cream. Crown with the reserved bun tops and dust with icing sugar. « It Must Have Bean Love.